My husband and I used to grill A LOT! In fact, he is known for his grilling abilities in some circles. When we went plant-based last year we pretty much gave up grilling, until now. These Portobello Burgers and veggies were my first attempt at plant-based grilling. I can tell you it is quite a different experience, but I’ll keep those details to myself because I get somewhat disgusted when I think about actually cooking animal flesh. Mix all ingredients for the marinade in a large bowl or shallow making dish. Other spices can be added and ingredients can be doubled. Remove stems from portobello’s then rinse and carefully dry with a paper towel or cloth. Place portobello’s in marinade to 20 to 30 minutes, flipping half through. Place on a hot grill, check them after 10 minutes, then flip and cook for an additional 5 to 10 minutes. (I needed to cook mine a little longer but my grill wasn’t hot enough. 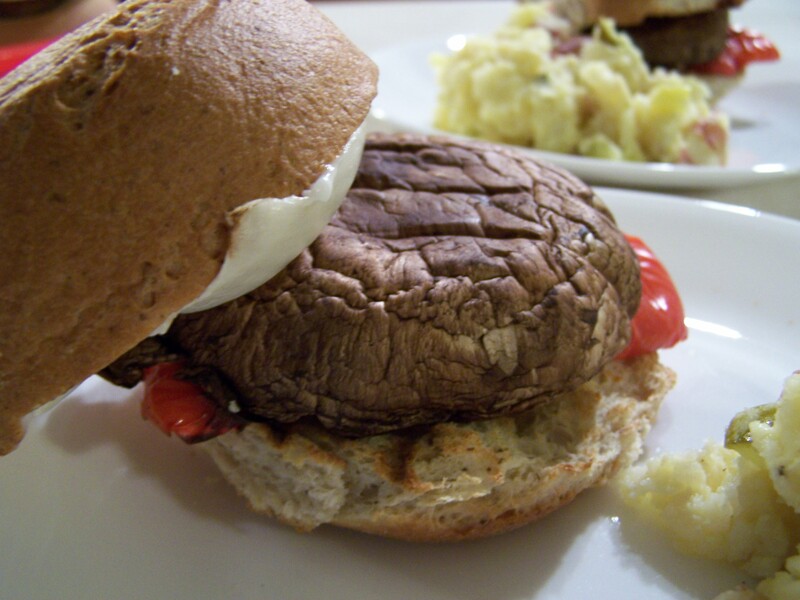 I served these Portobello Burger’s with grilled red bell peppers and grilled onions on gluten-free buns (that were also put on the grill) and a side of Potato Salad. My husband had his burger with barbecue sauce but you could add your favorite toppings. These burgers could be cooked in the oven instead of the grill but it is too hot for that here. I told my husband if I turn on the over there had better be cookies involved! Bake potatoes until soft then let cool enough to be handled. I left the skins on. You could boil these instead of baking them. Mash the potatoes until they are close to the texture you like. I grew up eating smooth and creamy potato salad but I prefer it with more texture. Add diced pickle and onion and gently fold into potatoes. Add mayo and mustard. You could add more mayo but I’m not a big fan of the flavor or the added fat. I added 1/4 cup of almost milk to get a slightly creamer consistency. Some varieties of potatoes may be creamy enough without adding the milk. Lastly, add salt and pepper to taste. 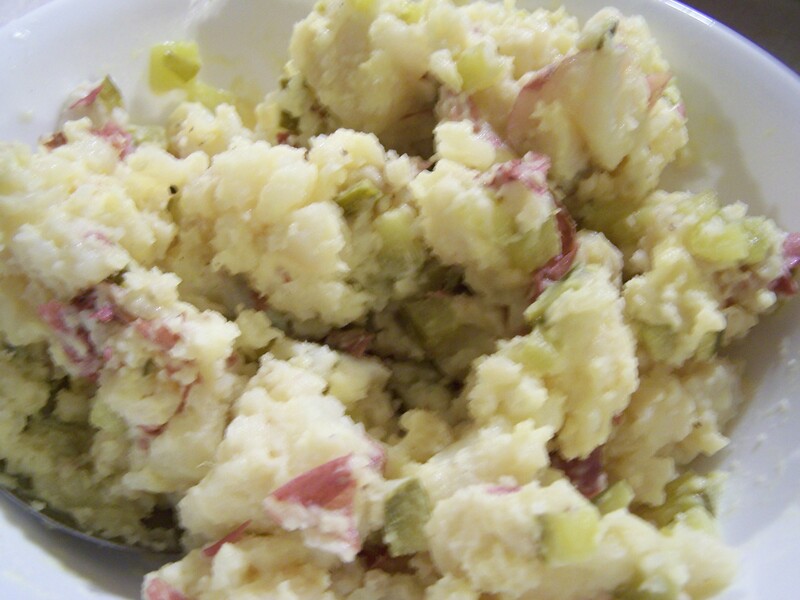 This potato salad is great when it is a little warm and just made but equally good cold. You could add garlic, paprika, or any number of different spices. It makes a great potluck dish and is much better for you than it’s non-vegan counterpart. 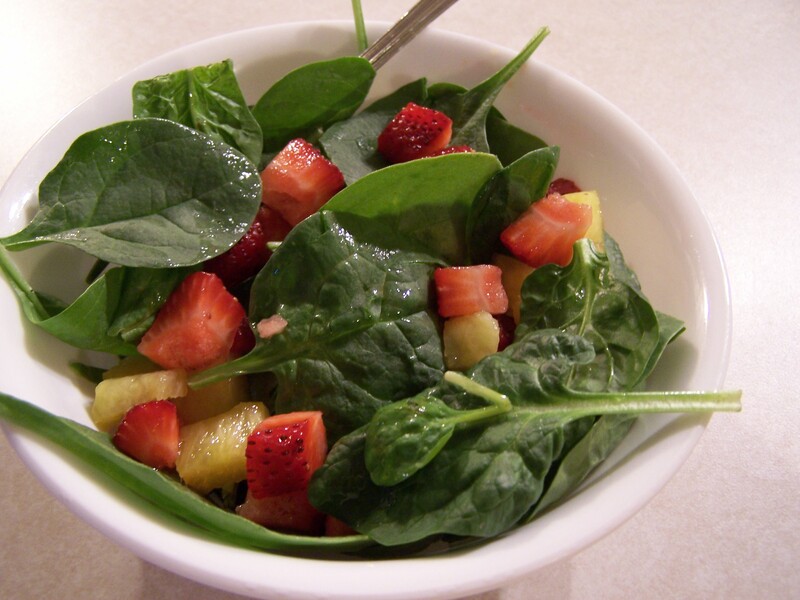 I ate this meal with a spinach-strawberry-pineapple salad, YUM! Most of my salad was confiscated by my 3 year old who loves to eat “leaves”. Are you a Plant-Based Griller? What are your favorite things to grill? Wow, Holly! That looks SO DELICIOUS! But… I think this would be a really difficult taste for me to get used to. I can’t imagine a mushroom tasting like a burger. Dairy was really quite easy for me to give up, but do you know what my deep-seeded craving ends up being when I’m “detoxing” from that carnivorous way of eating? HAMBURGERS! Honestly, do they really taste close to a beef burger or is it a taste you have to adjust to? It does NOT taste like beef. My husband said he liked it better than beef but we have had a lot of time for our taste to change. This would best be served to someone who likes mushrooms. I prefer a black bean burger to these but my husband liked them and they are really easy to make. If you like Mexican food you should try the nachos I have listed on the Recipe page or the quinoa taco meat, it makes you feel like you are getting that fatty fast food but it is all completely good for you.